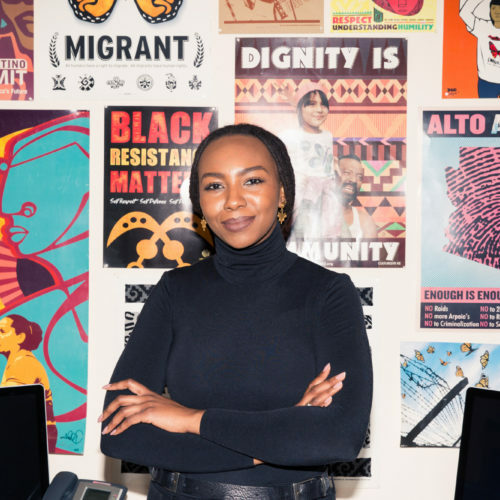 Opal Tometi is a Nigerian-American strategist, writer and community organizer committed to advancing social justice and human rights. As a co-founder of Black Lives Matter and the Executive Director of the Black Alliance for Just Immigration (BAJI), Opal works to support the leadership of Black people to defeat structural racism and discrimination in any context. A millennial trailblazer, Opal is widely respected for her creativity and bold leadership. At age 28 she became the Executive Director of the Black Alliance for Just Immigration (BAJI) – the United States’ premier national immigrant rights organization for people of African descent. An international thought leader, Opal addressed the United Nations General Assembly, a privilege only a few US Black leaders have been afforded. Ms. Tometi is a well-known expert on a wide range of civil, immigrant and human rights issues, and is the author of dozens of articles on public policy matters. She has appeared on CNN, MSNBC, BET and her words have been published in popular outlets such as Cosmopolitan, Huffington Post, and TIME Magazine.